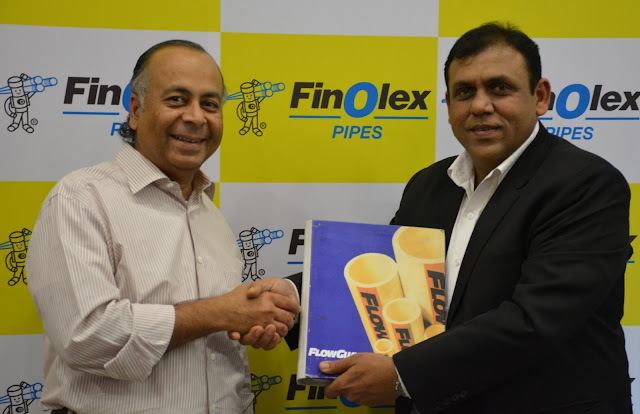 CLEVELAND and Pune, INDIA, February 15, 2017 – The Lubrizol Corporation, inventors and the largest manufacturers of CPVC compound worldwide, and Finolex Industries Limited, the leading PVC pipes and fittings manufacturer in India, today announce the signing of, FlowGuard® Processor agreement for the manufacturing and sale of Finolex FlowGuard® Plus pipes and fittings in India. The product will be launched in the market by Finolex Industries Limited in the last week of March 2017 and will cater to the building and construction industry. Lubrizol introduced the resilient CPVC material into India nearly two decades ago. Since then, India’s plumbers, engineers, builders and consultants have been reassured by the only material of its kind to be designed and approved to meet all global standards. The Lubrizol Corporation’s CPVC Piping Systems and Materials business is the innovator and world leader in chlorinated polyvinyl chloride (CPVC) resins and compounds. Our high-performance and low-combustibility CPVC technology can be found in FlowGuard® Pipe & Fittings, BlazeMaster® Fire Sprinkler Systems and Corzan® Industrial Systems designed for plumbing, fire protection and industrial piping applications. In addition, our CPVC product is also used in a variety of specialty applications serving diverse markets. Backed by robust research and development capabilities and the technical expertise of our piping systems consultants, billions of feet of our CPVC piping systems have been installed globally. For more information, visit lubrizolcpvc.com. The Lubrizol Corporation, a Berkshire Hathaway company, is a technology-driven global company that combines complex, specialty chemicals to optimize the quality, performance and value of customers’ products while reducing their environmental impact. It produces and supplies technologies to customers in the global transportation, industrial and consumer markets. These technologies include lubricant additives for engine oils, driveline and other transportation-related fluids, industrial lubricants, as well as additives for gasoline and diesel fuel. In addition, Lubrizol makes ingredients and additives for home care and personal care products and specialty materials encompassing polymer and coatings technologies, along with polymer-based pharmaceutical and medical device solutions. Our products for the oilfield market include technologies for exploration, production and transportation. With headquarters in Wickliffe, Ohio, Lubrizol and its subsidiaries own and operate manufacturing facilities in 17 countries, as well as sales and technical offices around the world. Founded in 1928, Lubrizol has approximately 9,000 employees worldwide. Revenues for 2015 were $7 billion. Finolex Industries Limited, headquartered in Pune, is the leading supplier of PVC pipes & fittings for the agriculture and non-agricultural sectors. Our state-of-the-art manufacturing plants at Pune and Ratnagiri in Maharashtra and Masar in Gujarat help to provide significant resources to better serve customers. Our own PVC resin manufacturing facility in Ratnagiri, set in technical collaboration with Uhde GmbH, Germany with Hoechst technology, provide a consistent supply of superior quality resin to our pipe manufacturing plants which produces top line quality products. Our open sea cryogenic jetty, the first of its kind in the Indian private sector, has been the hallmark of our PVC complex. 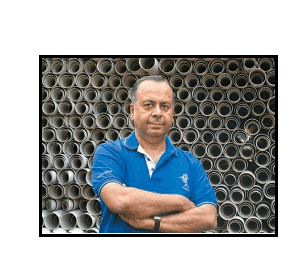 We are the first Indian PVC Pipes manufacturer to have been awarded the ISO 9001:2008 certification. Our major strength lies in our skilled workforce. We recognize and attribute our operating excellence and success to our employees. We have an a widespread presence throughout the country, with a wide network of over 17,000 retail outlets ably supported by dealers and sub-dealers who work as our extended arm in bringing quality products to customers. Our core values of quality, trust and integrity help us build an unbreakable bond with customers and stakeholders. We believe in “Performance with Purpose” and are deeply concerned about society and our community. We have been actively working along with Mukul Madhav Foundation, our CSR partner, in contributing to the social and economic development of the underprivileged sections of society in and around our plants in Ratnagiri, Pune and Masar with special focus on education, healthcare, community development, environment and self-development. Our focus is on women and children, thus, enabling the deprived to improve their quality of life through good education and accessible healthcare facilities. Mr. Prakash P. Chhabria is the Executive Chairman of Finolex Industries Limited, India’s leading manufacturer of PVC Pipes & Fittings. A well-known industrialist having over 29 years of experience, he has been in the full time employment of the Company since 13th March, 1992. Mr. Chhabria is a member of the Executive Committee of the Mahratta Chamber of Commerce, Industries and Agriculture. He is also one of the Founder Trustees of Mukul Madhav Foundation, a trust engaged in charitable activities in the area of healthcare and educations of children. He resides in Pune with his family.